I also added my Godox AD-S18 Flash Tube Bulb Metal Protector Shovel Cap to see if blocking the flash bulb at the entry point would produce even light. But instead it reduced the amount of light across the entire face! Center was f22. Godox AD-S18 flash tube shovel. 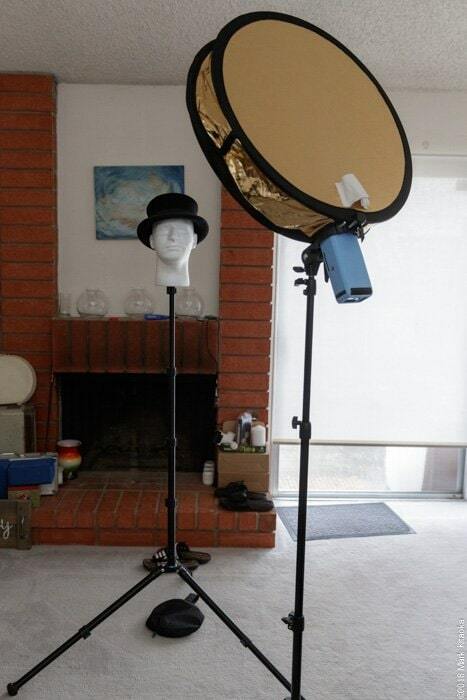 So I’ve determined for the uses where I plan to use the Sundiscs, I will simply use the Fresnel head on the 200. 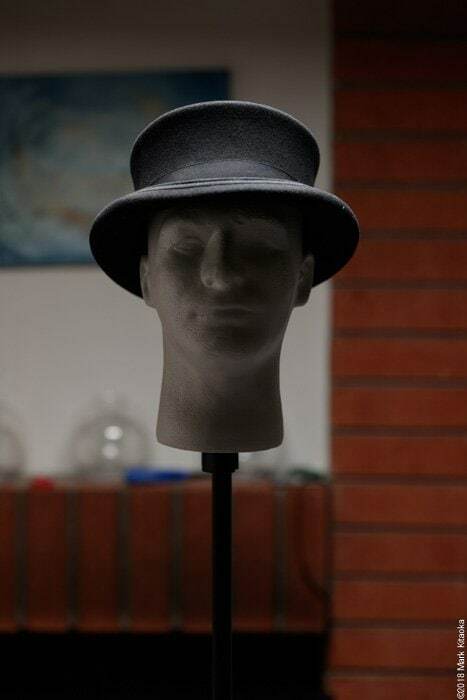 It’s less prone to breakage than the bare bulb and I have a modeling light when using the Fresnel attachment. Keep in mind all of this was done using a Godox S Bracket to hold the 200. 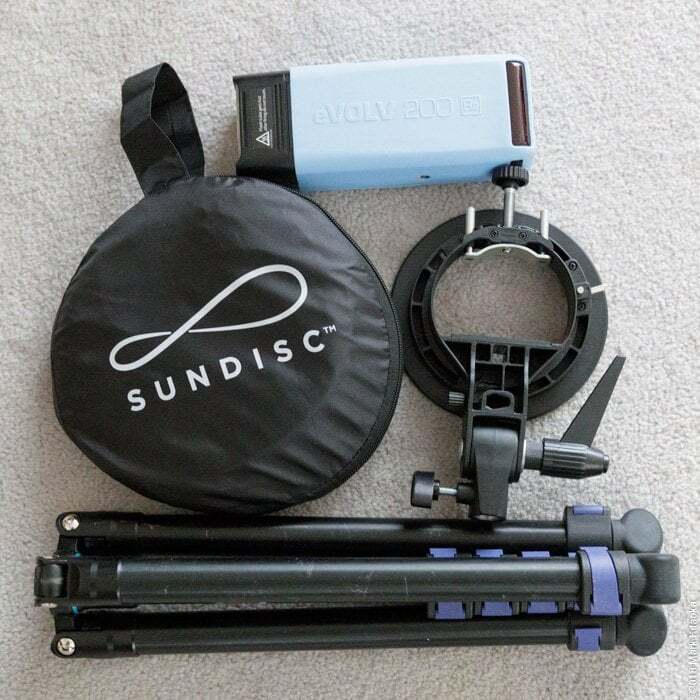 I came upon an article by Michael Sewell about the Sundisc modifier. His review intrigued me enough to further research the piece of kit. After looking it over on other sites and reading his review in full, I felt it worthwhile to invest in two to see how I could use them in my workflow. My original thought was to use them in those infrequent, but frantic ‘run and gun’ situations where a client needs me to go around different parts of a venue and with very little time with the talent. 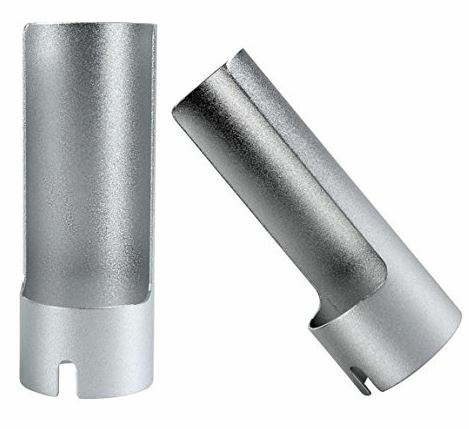 I also thought that they may be a nice alternative to overhead or side fill lights. It took about two weeks from ordering to arrival since they are shipped from China directly to the consumer through Sundisc. As with all gear I test them thoroughly before even considering using them on set. Determining the best use of a tool along with how I would configure it is just protocol for my workflow. So the first task is always examining the quality of the construction. The units are well made, seams are well sewn, zippers and elastic are of high quality. 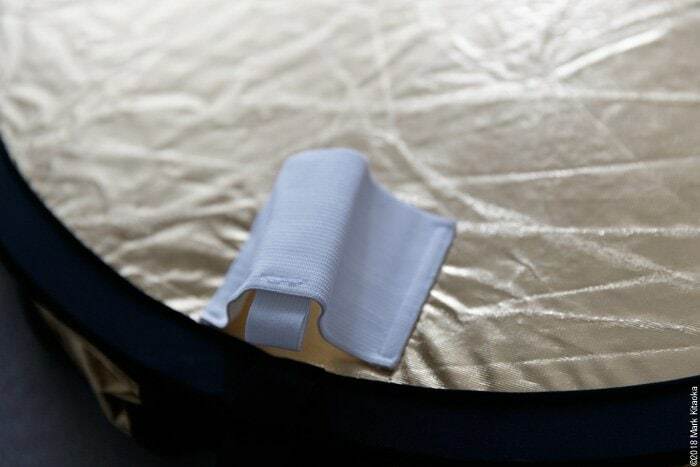 The reflective materials are thick and well placed. 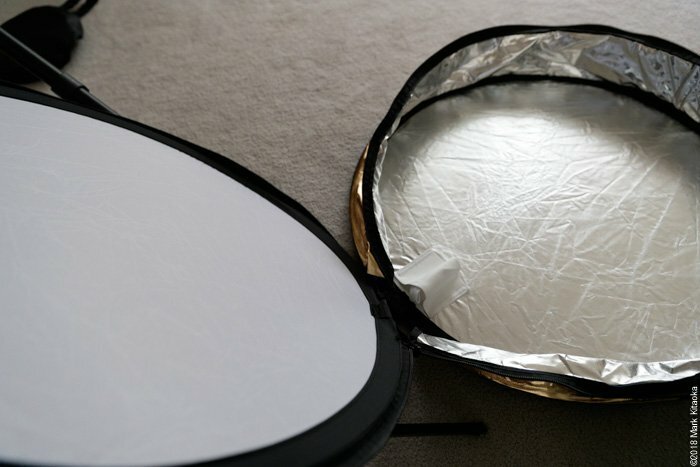 The Sundisc allows you to reverse the modifier for silver or gold reflection, very nicely done. The elastic loops are designed to hold speedlights, but I found that using a Godox S Mount is much more useful than using the elastic bands. You’d have to use some sort of swivel anyway to mount this to a light stand so I found that an S Mount is just right for my use of the Sundisc. 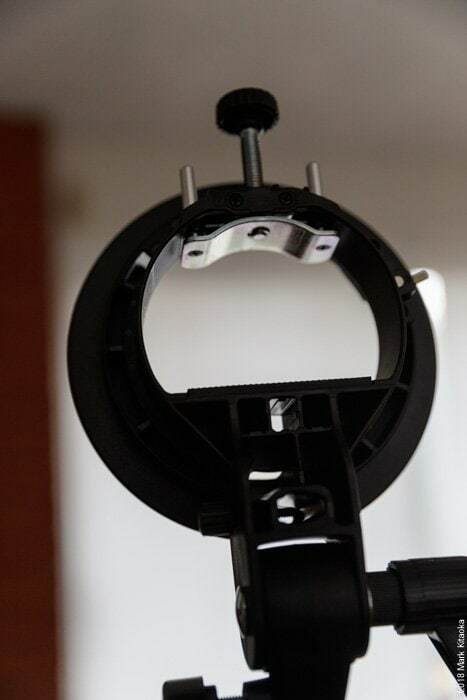 The Godox S bracket fits perfectly snug inside the Sundisc. I have modified my S brackets, removing the rubber from the compression bracket. It allows me to insert my eVOLV200s with the silicon skins attached. Silver interior. Here you can see the elastic strap designed to hold a speedlight in place. Close up of the elastic band. 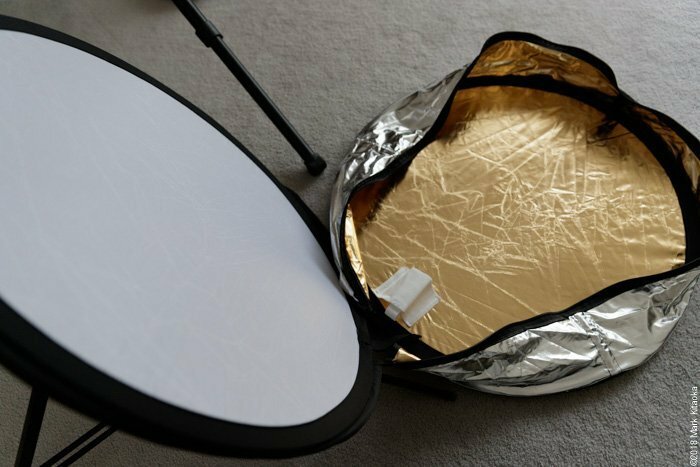 Although it is of high quality and well sewn, the band allows the Sundisc to ‘flop’ over once you tilt your speedlight beyond 80 degrees. I want to have the ability to adjust the modifier to any angle without it flopping over. It’s extremely easy to reverse the Sundisc from silver to gold. A great design. All of this would easily fit into a small backpack! Perfect for any run and gun imagery or portraiture. At this point I only tested the Sundisc with my eVOLV200 using the Fresnel head. The bare bulb attachment would easily work as well. 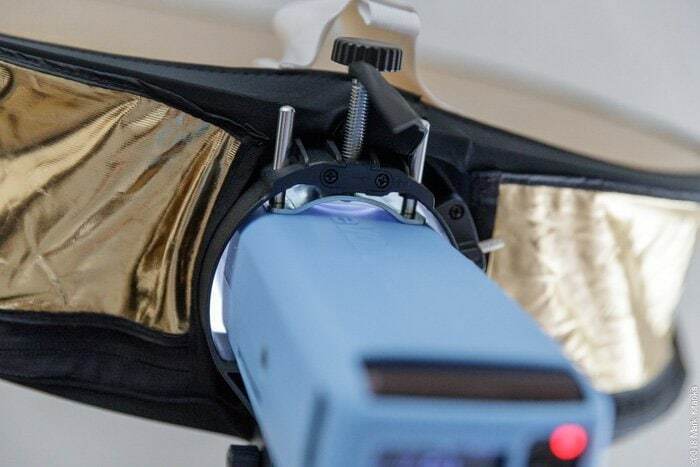 One of the other advantages of using the S bracket is the ability to place the head of the strobe very low in the modifier, thereby filling the entire surface of the diffusion panel. Keep in mind that I don’t think I’d ever use this outdoors or in a mild breeze. I’m not sure how the construction of the disk keeps the sides separate, but whatever is holding them apart works well. 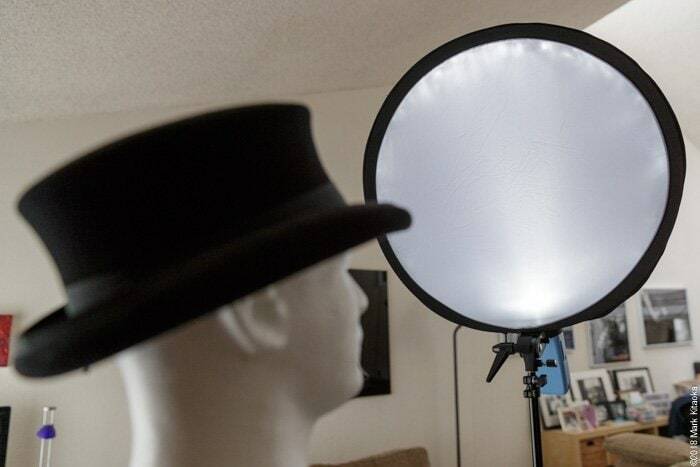 Yet even a slight breeze would cause the modifier to twist or turn, so for me I’d only consider using it indoors. So I decided to try it on Bob to view the quality of light the Sundisc produces. Bob’s set up. The Sundisc is about 5 feet away from him. Very good quality of light, much like a nice softbox. My eVOLV200 modeling light is turned on. As you can see by having the strobe placed low in the modifier, it allows the light to more fully fill the disc. 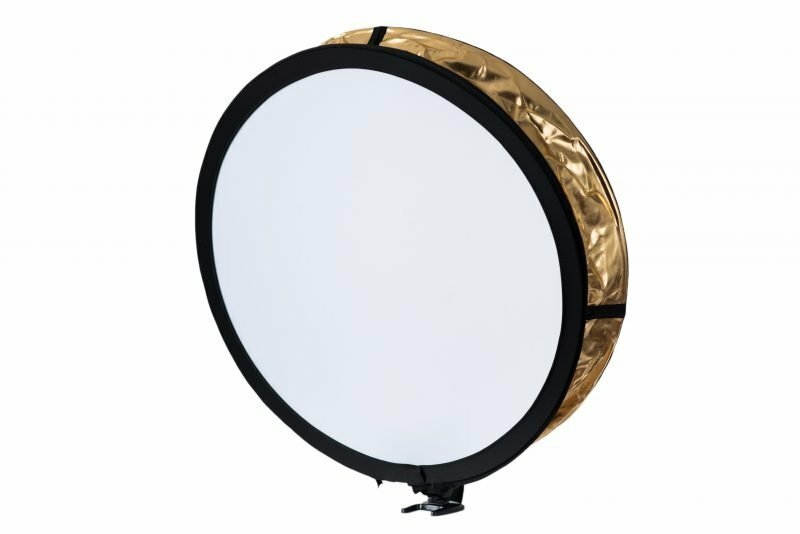 By using the elastic band inside of the unit to hold a strobe or speedlight it places the unit about 4-6 inches into the modifier and creates a dark area at the bottom when triggered. 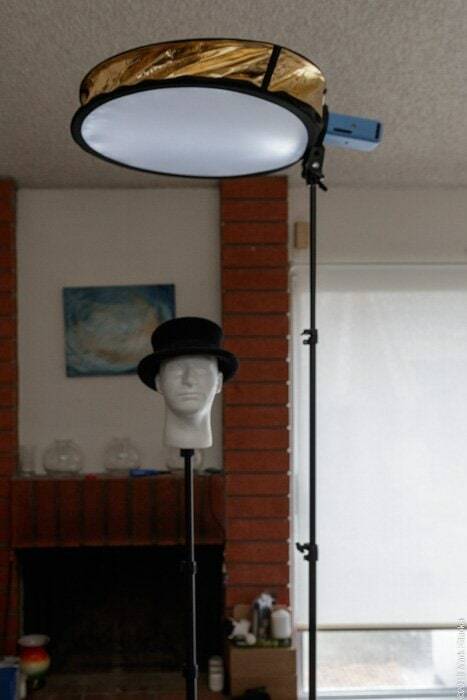 Some people may ask if the strobe produces any hot spots in the modifier close to the actual flash head. At this time I didn’t notice any hot spots. This is most likely how I will use the Sundisc, as a hair or fill light. It’s very light at only 14 ounces and placing it on a boom with my eVOLV200 and S bracket will allow me to be very portable. Not to mention using a boom arm that is light weight. Testing it as a hair light. 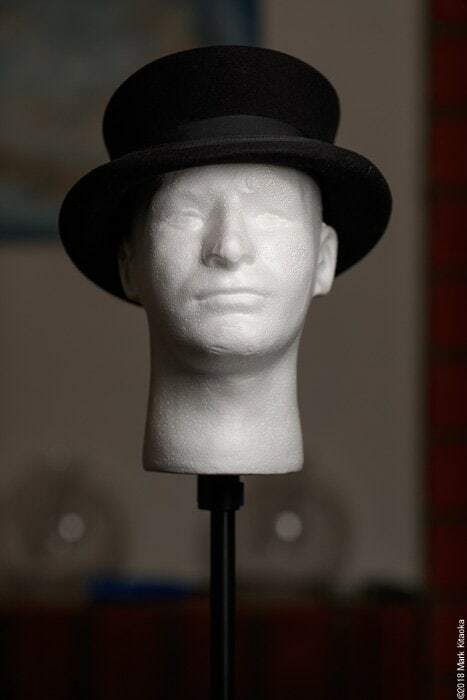 Since like me, poor Bob has no hair so I let him use my custom made top hat! During my initial evaluation of this unit I find that the quality of materials and the quality of light it produces is well worth the investment. Obviously during actual use more uses/issues may become apparent than just during my initial overview. I really like how thin the unit is and how small it packs down to transport. It’s very light weight as well which is another plus. The only downsides I see right now is my perceived inability to use the unit in a breeze, but other than that I’m happy to try them on a commercial shoot. Although they will work with my H600 remote heads using a Bowens ring to insert into the hole of the Sundisc, I doubt I’ll be using them that way. Using it as a key light? Uhhh….not sure, maybe? Like I always say, never say never….Time and experience will tell though….